One of the most iconic places in the South West USA, I was excited about showing my daughter the Grand Canyon and looked forward to sharing the spectacular views with her. We entered the park via the East entrance and drove along the scenic Desert View Drive. There are many stops along the way to park and enjoy the view as it develops. The mighty Colorado River can be seen gushing below and the sheer scale of the place is astounding. 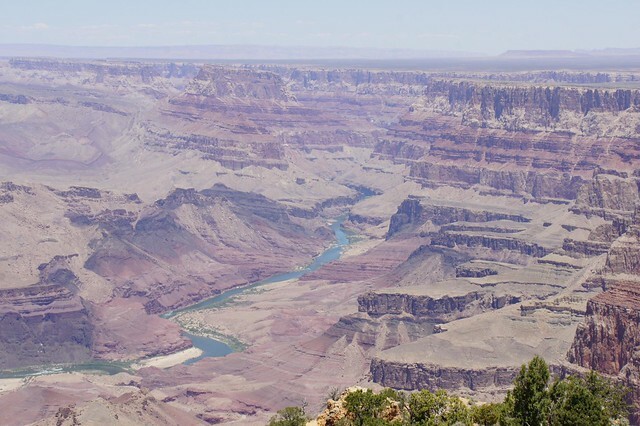 For a child, however, one view of the Grand Canyon looks surprisingly like another and after the 4th stop, it was made abundantly clear to me that this getting in and out of the car business was no fun. She would rather stay in the air-con than face the high temperatures and more views. I was quite surprised by the reaction, so left her reading in the car whilst I took in the views on my own. We continued our scenic drive an eventually arrived at the very busy Grand Canyon Village where we went to the visitor’s centre to pick up more information about the Grand Canyon. We watched a short information film about how the Canyon was formed and then found a park ranger to talk to. I had originally planned on heading to the other main view points, but could tell that this would involve quite a battle of wills as it was very very hot, so instead we signed her up for a ranger’s programme. 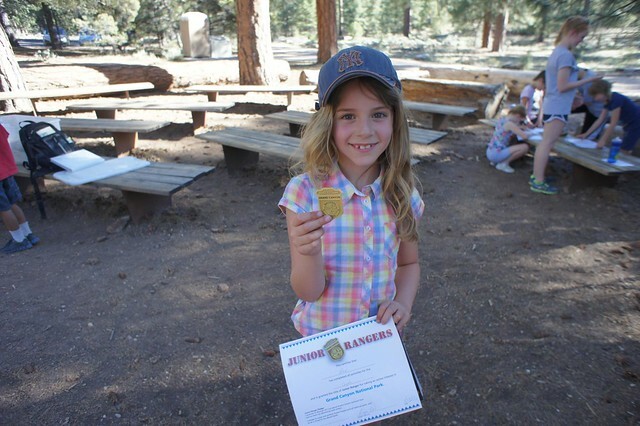 She was given a pack to fill out and then was instructed to attend a ranger lead event. Now it was me dragging my heels. I had come to take in views, not attend cheesy ranger programmes, but given that I had subjected her to a long car journey that day and had planned a hike for us the following morning, I decided to let her win this one. She filled out her questionnaire with enthusiasm. There were different packs for different ages, going right up to teenage years and a great choice of ranger programmes to attend. We decided to go to a ranger talk about the wildlife in the Grand Canyon and sat in the shade of the pine forest while the ranger passed around skulls and animal dung for the children to identify. All of the 30 odd children were enrapt (as were the parents) At the end of the talk, much to my daughter’s delight, she was inaugurated as an honorary ranger of the Grand Canyon. The following morning, we woke up very early for a hike below the rim of the Grand Canyon. Unsure about the heat and how far down it would be wise to go, we had a guide with us who was able to judge the distance that we should walk and choose a suitable walk. The views from beneath the rim are mesmerising – you get so much more of a sense of scale when you go a bit lower and can see the different strata in the rock so much clearer. Again, it was well worth going early and getting away from the crowds. The walk up again was arduous, but worth the pain and there is no doubt that we both enjoyed the experience much more than if we had done one of the self-guided walks on the rim with all of the other hundreds of people. Two days was about right for us in the Grand Canyon. I had a chance to escape the crowds and marvel at the views, whilst my daughter really enjoyed the chance to be with other kids and have a break from the driving and views. It was hot and we were both heartily relieved at the sight of a swimming pool after a long day’s hiking.